Stirling III EJ108 attacked over Skagerak 4/11 1943. The aircraft belonged to RAF 75 Sqn. Bomber Command and was coded AA-O. T/O Mepal 16:00. OP: Gardening Silverthorn. Landing Mepal 23:20. When returning from Silverthorn on course 250 degree with the three mines still onboard EJ108 was attacked by a German night fighter piloted by Oberleutnant Hermann Müller of 10./NJG 3 on position 57`48N 09`48E (North west of Skagen) at 20:02 hours. 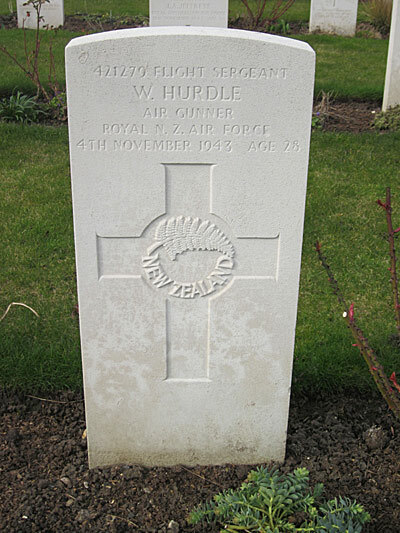 The rear gunner Sgt Walter Hurdle RNZAF was killed by the first bust of the enemy aircrafts cannon shell. When Pilot P/O E. Witting saw the tracers he corkscrewed to starboard and by doing that got away from the night fighter. The mines were afterwards jettisoned safe on position 57`37½N 08`45E. After landing back at Mepal the following damage was found: Holes in fuselage, Starboard flap shot away, port elevator practically severed. Sgt Walter Hurdle was laid to rest in Cambridge City Cemetery. The rest of the crew were Navigator F/O W. Anderson, Air bomber P/O J. Thomas, Wop Sgt O. Marshall, Flt.Engr. Sgt A. Gunn and Mid upper gunner Sgt R. Morfett. Sources: AIR 50/192, AIR 25/70, Nonnenmacher file, TW.